Jason Kruk and our minimalist bivouac setup in the Torres of Argentine Patagonia. Cerro Fitz Roy in the background. I’d like to start this article by just mentioning a thing or two about my intention in writing it. I am stoked to share some of my personal thoughts and strategies in regards to going as fast and light as possible in the mountains. Climbing however, is different for everyone, and each individual is responsible for making their own decisions regarding what they are comfortable with and how far they want to push their limits. As a climber I am always trying to raise the bar in some way or another, at least on a personal level. Whether it is going as fast as possible, as far as possible or just climbing right at my mental or physical limits, these goals demand a minimalist approach. This approach involves leaving behind what many would consider to be critical items and does not necessarily suit every climber out there. Some of the tactics I like to use for moving fast might seem unnecessarily dangerous, but these tactics do not always require taking more risks when the bigger picture is considered. Hopefully this article explains this in a way that is easy to understand. The degree to which you take this advice to heart should depend on what you are personally looking for in climbing. If you are looking to push your limits and climb significantly faster, and in more committing situations, this may be just the article for you. Regardless of whether you plan to use the tactics and strategies brought forth in this article or not, the information provided could very well be of interest. A very important concept that I’d like to begin my article with is that faster almost always means lighter. However, lighter doesn’t always mean faster. Think of a party speed climbing the Nose; they likely have a light rack, one rope, one set of jugs, a light pack with a couple litres of water and not much else. They can race up the wall at lightning speed because they are comfortable running it out and belaying very little. They don’t need puffy jackets or tonnes of water as they will stay warm through exertion and be able to rehydrate at the car in a matter of hours. However, if a team of less experienced climbers replaced every single carabiner on the rack with a lighter equivalent, ditched the second rope and left the portaledge in the car, they are not going to race up the Nose in a matter of hours. This is obvious, and an extreme example of course, but the concept is the same for most climbing situations. The alpinist must learn to move faster before he/she can begin to travel significantly lighter. Not the other way around. Once the climber has the ability to move faster over more complex terrain, he/she can be certain that it will be safe to leave behind heavy items such as bivy gear or extra insulating layers. This will in turn make it much easier for the climber to move as fast as possible, but that skill must already be present. This concept essentially dictates that the key to travelling lighter on alpine routes is by raising ones overall competency on alpine terrain. Building confidence on moderate terrain is by far the most essential ingredient in gaining the ability to move quickly in the mountains. The ability to confidently move un-roped on mid-5th class rock, steep snow and moderate ice can open up a whole new realm of possibility for the alpinist wishing to move fast and light. I believe that the ability to solo 5.8 or 5.9 is a more valuable skill for the alpinist than the ability to onsight 5.12 trad. Building the confidence and technical skills to move more easily and freely in the mountains in turns allows one to reduce the time spent vulnerable to objective dangers or weather changes in committing situations. 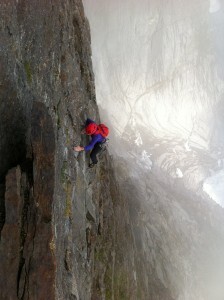 Tony Mclane climbing un-roped on the East Pillar of Slesse Mountain. By simul soloing most of the route, only belaying two pitches of stiff 5.10, we climbed the 28 pitch route in 4 hours. We climbed very carefully, never racing and testing our holds methodically. I’m not trying to encourage people to start taking great risks in their climbing. 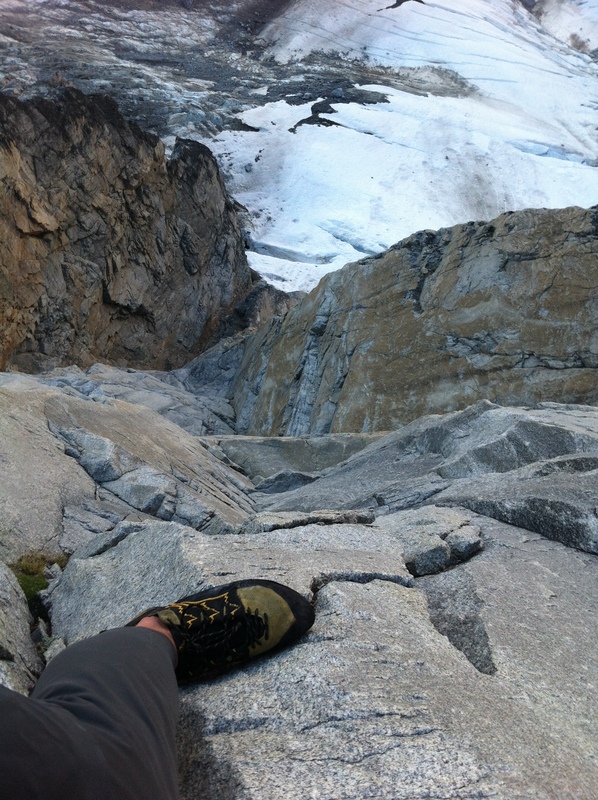 If stopping to place gear frequently, in a ‘just in case’ manner even though a fall does not seem likely, is how you need to climb to feel safe there is nothing wrong with that. But that method of climbing will never be exceptionally fast, and you will always need to carry more equipment to compensate for the amount of time spent on the route. Shaving grams by taking lighter bivy gear and lightweight carabiners will make your pack a tiny bit lighter, but the bottom line is that you are still carrying bivy gear, placing a lot of protection, and going slow. While constantly protecting against a fall may seem like the safer option in the moment, you are increasing your exposure to danger from other, less predictable sources. Building total confidence on more moderate terrain requires mileage and experience. Most of all it requires building up a broad base level in your technical skills rather than always trying to achieve a ‘peak’ level of performance. We have all seen the climber at the gym or crag working the moves of a very difficult route, but struggles to onsight climbs a grade, or even several grades easier. This is a certain path to becoming a climber with a resume of 5.11 trad sends that places way to much gear on an alpine 5.8. If this is you, consider spending more time at the crag climbing routes that feel challenging to some degree, but not so challenging that you are likely to fall off. Climb some easier routes that you are very confident on and practice running it out but only when you feel in control. Once you have accumulated some mileage for the day go throw yourself at the project that requires working all the moves. Or divide days at the crag into mileage days and project days. This is a good way to solidify your base level while still working to raise your peak level. This approach takes time and commitment; it is not an overnight process. However it is supremely satisfying when you and your partner approach that grade V alpine you’ve dreamed about for ages, then simul solo it before lunch and are home in time for dinner. A key point that must be taken into consideration is that running it out and climbing unroped should always be done in a controlled and comfortable manner. Building up a large base of experience on terrain below your limit is the road to feeling calm and in control on various types of terrain whether protection is available or not. Feeling shaky and uncertain while trying to push yourself to run it out or solo is a recipe for disaster. The point I a trying to drive home is that by accumulating a huge amount of mileage on this kind of terrain, will eventually allow you to calmly climb such terrain unprotected and feel safe while doing so. 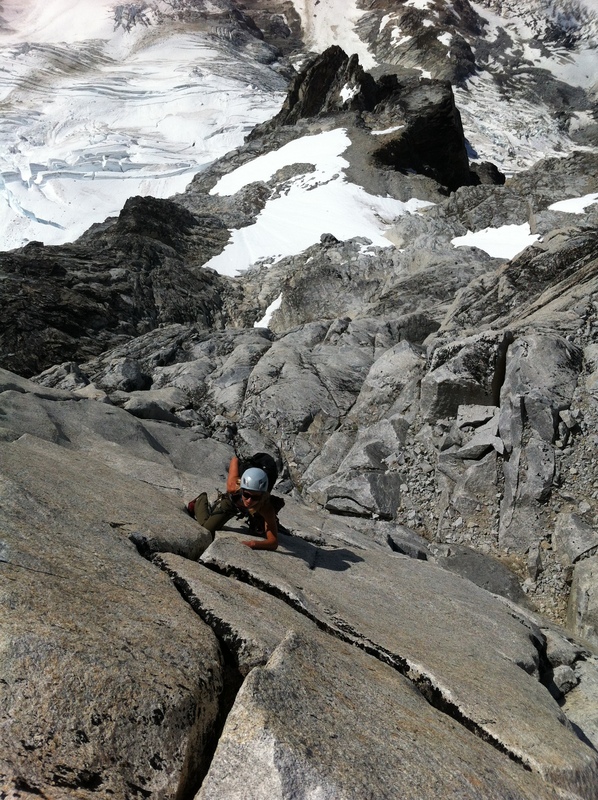 Brette Harrington scrambling mid 5th class terrain on the South Ridge of Serra 2, Waddington Range B.C. The ability to simul solo moderate terrain allowed us to climb the 1,500 meter ridge, and establish a hard variation in a day. We slept in and started late, and were still back at base camp before dark. Being extremely proficient on moderate terrain is the basis for moving fast, and in turn light, in the mountains. Having a solid base will also provide the platform to raise your peak performance level as well, and is what you will rely upon when trying to send that cruxy pitch right near your limit. Most big alpine routes with a very difficult free climbing grade are not sustained at that grade, and if they are a party moving fast and light on that route will likely be able to climb significantly harder than the given grade. A big route in the mountains that has many sustained pitches of 5.11d climbing will not be climbed in a fast and light style by a party who struggles on 5.11d. A party moving fast on a route like this will likely be solid 5.12+ or 5.13 climbers who can consistently onsight 5.11d with little effort and place little gear. Alpinists must be realistic about their abilities when choosing an objective to approach in a fast and light style. 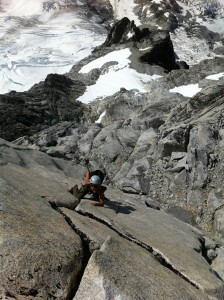 Free soloing sustained technical terrain during the first solo ascent of Serra V, Waddington Range, B.C. 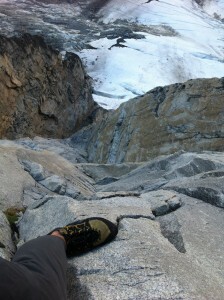 The confidence to solo this steep previously unclimbed terrain allowed the author to avoid a rockfall strewn approach couloir, reducing objective hazards. In addition to moving quickly while un-roped on moderate alpine terrain, there are various other strategies to reducing the time spent on a route even further. Like building up a base of competency on moderate terrain, these strategies may require training to be able to employ effectively. An extremely effective way to move faster in the mountains is to reduce the need to take breaks; this is obvious but often seems to be overlooked! Improving general physical endurance is another key to improving overall performance on big alpine routes. The ability to sustain a pace all day, without the need to take breathers is an absolutely essential tool in the alpinist’s belt. The speed at which one can hike without hyperventilating dictates how much ground one can cover over a long duration of time. Attempting to increase the pace, by running or moving at a rate which causes one to become short of breath is highly counter effective during long days. Time will be wasted recovering from such stints, and more often than not muscles in the legs will require a day or two to recover from this sudden increase in workload. The best way to moderate your pace into something sustainable during long days is by limiting yourself to breathing in through the nose. If you must breathe through the mouth and ‘gasp’ for air then you are trying to move too fast. Fit rests in to natural breaks during the day. This means that when the base of the route is reached and you and your partner remove your packs to rack up, this is your time to rest! Try to avoid ever stopping to rest unless there is something else that needs to happen that requires you to stop moving. This might be as simple as stopping to remove a layer, which will require you to remove your pack and stop moving for a minute; this is a productive rest, make the most of these seconds spent standing still! Once the layer is in the pack keep moving and get on with it. -changing into rock shoes or boots. -Removing or adding gear to the pack. Essentially, one should try to never just sit down and turn the brain off in order to rest; resting should always be timed with completing some other productive task. Turning your brain off and sitting on the ground is to be done when you get home, or return to base camp after your climb. When possible try to get as many birds stoned at once as you can while resting. This looks like: approaching the climb at a sustainable and moderate pace, perhaps sneaking in a break as you put crampons on your boots and rope up for a glacier, continuing at your sustainable pace, then resting and sneaking in an energy bar and sip of water as you rack up for the climb. Always carry an energy gel or something similar in your pocket while hiking so that you can quickly fuel up without stopping. The next time you have to stop to complete another task, such as racking up or changing shoes, reload your pocket with another gel. This allows you to stay sufficiently fueled so that you don’t crash, without the need to stop frequently for the sole purpose of having a snack. Try to only stop moving when several things need to happen at once that require you to stop! An example of these practices put into action can be found in my one day solo link up of Serra V and Asperity Mountain in the Waddington range last summer. During that ascent I likely never stopped moving for more than 5-7 minutes at a time. I also never moved so fast as to hyperventilate which would have required me to rest and recover. All my stops included completing some crucial task such as changing into rock shoes, building a rappel anchor, or leaving my food, water and extra equipment at the col between peaks; the launch point for each summit bid. The author running it out on 5.10 terrain during the first ascent of ‘Cerro Mariposa’ in Argentine Patagonia. The first ascent party established 18 new pitches of new climbing to 5.11d A2 in a day. 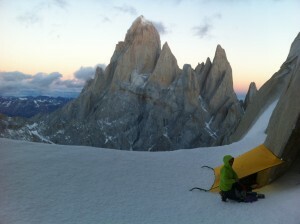 A cold open bivy on the summit followed regardless. Another place where time is often lost is at belay changeovers. Learning to manage belay changeovers in a fast and efficient manner is another essential tool for the alpinist who wishes to move faster in the mountains. First, leading in blocks is more efficient than swinging leads. 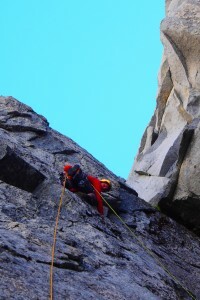 This allows the leader to recover from the efforts of the pitch as the second climbs so that he/she is refreshed when the second arrives at the belay. Swapping leads requires the second to catch their breath after reaching the belay and rack all the gear onto their harness before beginning the next pitch. However if the leader’s block is over, there is an efficient way to change over the lead. -Once secure, pull up all the extra slack and put the second on belay with an auto-locking belay device. -Remove all additional gear from the harness and clip it to the belay in an organized manner. Once this task is done then secondary tasks such as eating, drinking or taking photos can be done while belaying the second. -When the second arrives he can just sit on the rope as he is already secure, hanging from the auto-locking belay device. -The leader grabs the belay device from the second’s harness while the second grabs all the gear hanging from the belay and racks up for their block. -The leader put the second on belay on the second belay device, while they are still suspended from the anchor from the first belay device. -The second removes their attachment point to the anchor by taking the first belay device and clipping it to their harness. -The second is already on belay and ready to begin his block. Practice these fast changeovers with your partner on multi-pitch rock climbs so that you are both highly proficient at it when you are on a long alpine climb. A proficient team should spend no more than 2-3 minutes changing over the lead. During a leader’s block, the exchange of gear at the belay is relatively simple. As the second secures himself to the belay, the leader can grab the gear from the seconds harness and re-rack it on his own. Once secure, the second can grab the rope from the leader, stack it over his attachment point and put the leader back on belay. The leader is ready to grab their belay device, detach from the anchor lead the next pitch. This can easily be done in less than 2 minutes by a proficient party. Some parties are not interested in setting personal speed records and would prefer to spend more time relaxing, placing extra gear, taking in the scenery and chit chatting with their partner(s). There is nothing wrong with this approach and for some people focusing all mental energy on time and efficiency would be stressful and not enjoyable. However attempting very long and committing routes in this slower style exposes one to additional hazards from the environment as well as additional fatigue from spending more time in the elements. These tips are not meant to dictate how alpinists must climb in the mountains. They are just tips and strategies to help those who are interested in moving faster, lighter and more efficiently on big alpine routes. For me, completing a long and serious climb in a short amount of time with little gear is very satisfying, and it is from these types of pursuits that these strategies have developed. Take these strategies and integrate them into your climbing alongside training and body maintenance to take your alpine climbing to the next level, if you so wish. I agree wholeheartedly and enthusiastically with essentially all of this analysis! Skills and fitness are paramount! I think that breathing through the nose is not a sound strategy to moderate your pace, since limiting your oxygen intake in oxygen will unnecessarily accelerate lactic acid build up and fatigue. Pacing is a critical skill in fast endurance efforts, and this skill must be learned just like the other critical skills you mention. I might even argue that it makes more sense to use relatively high intensities in alpine climbing (as opposed to purely endurance running) because technical elements of the route force a slower pace regardless of the limits of individual fitness. Thus, one can afford higher intensities in non-technical parts. I would also say that running certainly IS a useful skill which, when the terrain dictates, can be effectively applied on routes where gear might consist merely of climbing shoes or a very light rap cord. All of these are relatively minor points and generally in accord with your main message, which I highly support. Thanks for the great post! I think what he meant by pace moderation is that if you are sustaining what is called a Zone 1 heart rate, you’ll easily be able to breathe through your nose without depriving yourself of oxygen. This will be at no more than 60-75% of your max HR. If you don’t have (or don’t want to carry) a heart rate monitor, the best way to know if you’re in that zone is whether you can comfortably breathe through your nose. As your fitness increases, you can move faster while still remaining in that zone. The reason a Zone 1 heart rate is preferable, is that you can keep going for long periods of time without a need for rest, and you’ll still have plenty of reserves for periods of harder effort.